Sorry about the provocative title of the blog. But, as promised, I wanted to write about my terrific experience this week in Bismarck/Mandan, North Dakota at a great organization called, H.I.T. Inc.. Logo of this wonderful agency. I was asked to come to present several NADSP Code of Ethics Encounters. Overall; in one day I was able to meet some people whom HIT supports, visit some of their programs, meet most of the leadership team and spend time facilitating three Code of Ethics Encounters with well over 300 HIT Staff members. They were remarkable people and let me tell you how I got HIT! John's HIT 1. The person-centered language was audible. Sometimes when I visit organizations, person-centered language is hit and miss (excuse the pun). At HIT, there is obviously a culture of respectful language. I did not hear the words or phrases; consumer, wheelchair-bound or "had a behavior".....there is a clear person-centered and respectful lexicon in use among the staff. John's HIT 2. The organization deeply values Direct Support Professionals. The resources that were utilized for this day, and from what I can see in terms of the other offerings for Direct Support Professional development and education, were abundant. 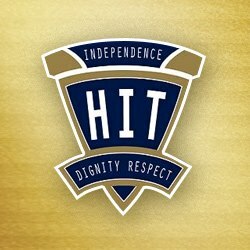 Direct Support Professionals are respected and honored at HIT. They are being viewed more and more as key players in the teams that support people with disabilities. They have a fair amount of authority and add to the decision making process each day. I spoke to several DSPs and this was validated. John's 3rd HIT (and maybe the best hit....) I asked the leadership team a question at lunch. I asked, "Why is North Dakota so good at supporting people with developmental disabilities? You guys are known throughout the country as being progressive and excellent at support?" The answer was simple yet very profound...and what all of us in the country should be considering. I was told that the state of North Dakota is like a big small town community. Granted it is a small state with relatively few providers and people supported. However, there is a clear "responsibility" that is shared for looking out for each other regardless of ability or disability. Perhaps it is the influence of Nordic/Scandinavian ethnic cultures (cultures known for respecting and revering people with disabilities) that settled the Dakotas, but ultimately there is a strong sense of mutual respect among North Dakotans. Sure, there have been legislative things and scandals that have helped bring services and supports to a higher level, but it is clearly in the culture of the state that brings a brighter future and hope for those who rely on support. I hope to visit my friends at HIT again very soon. They are a Direct Support -Centric organization. I can't wait to see what they will do next to promote the value of their direct support staff! Thanks to Christina Tosseth and Jeff Essler for hosting me and giving a warm North Dakota welcome even though it was 30 below 0 with a wind chill. Did not even feel it.....Thank you! !